Adam Bojelian was a remarkable person. 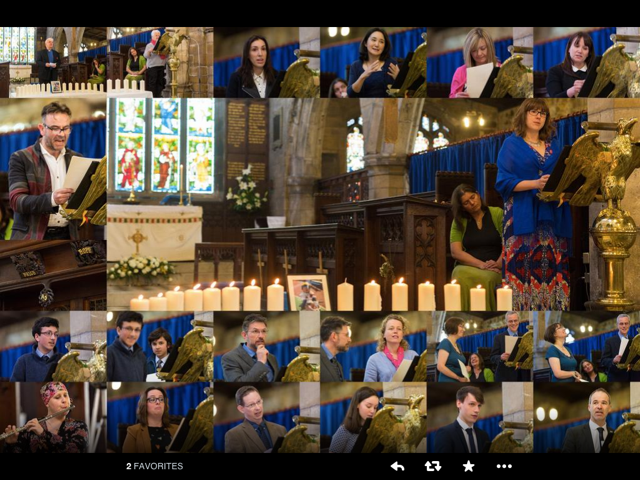 That was clear for everyone who attended the celebration of his life in Tadcaster yesterday. The celebration was a perfect reminder of the beauty of his poetry – cousin Lara reading The Green Fish was a personal highlight – and the tributes came from across the globe for someone who touched the hearts of many with his can do attitude. A fifteen year old boy who wrote poetry by blinking and captured the imagination of anyone he came across. Adam was a “No Excuses” role model. The photographer Paul Clarke read “My Creation Myth” and prefaced it with this statement – so simple and true. Adam had every reason to not do his homework, be bitter about life or let his challenges get him down. Instead he approached life with glee, never making excuses. For him “every colour was perfectly placed”. And a duff joke or two was always at hand. Alongside people like Lara and Paul, I was privileged to be asked to be one of the 15 people to read one of Adam’s poems and say a few words. 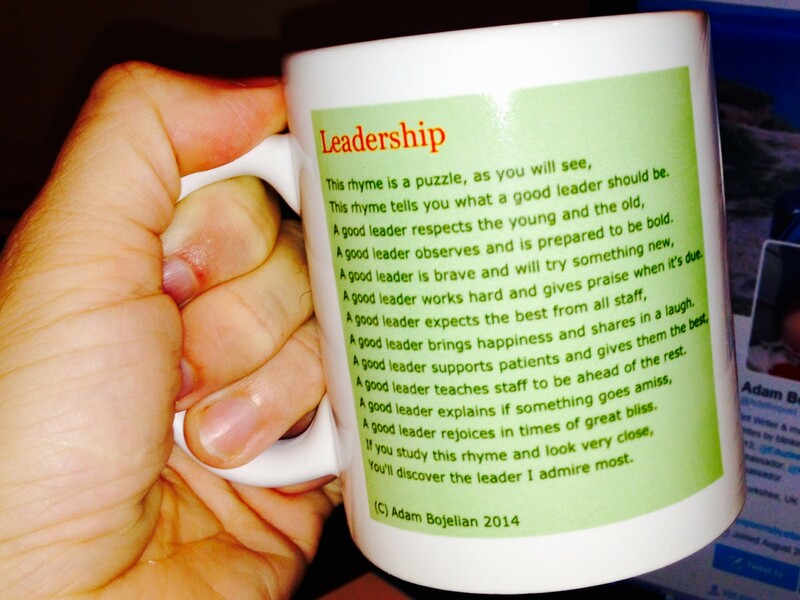 The poem was Leadership – something I commissioned for the NHS Confederation Conference in 2014. 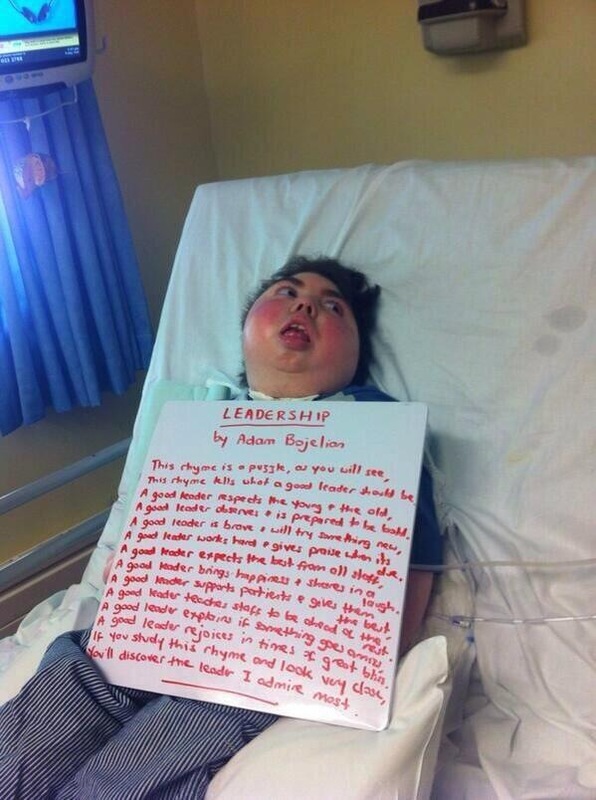 I needed something to set the tone for the whole of the leadership in the NHS and Adam responded brilliantly. He gave us something that defined good leadership and challenged our perceptions about the potential of people. I read the poem and new that it was right, it was wise and it was clever. A challenge to the reader to be a better leader. It was exactly what was needed and I shared it on Twitter. It was read and retweeted widely. Some time later, someone pointed out that the poem’s puzzle had been solved. It was not just a challenge to the reader but also spelled my name down its spine. I had missed this completely and it was something I won’t forget – one of those moments that catches you inside and is truly humbling and a personal challenge to me to be a good leader too. Subsequently the poem has had a life of its own. It was a wow at the Confederation Conference receiving spontaneous applause from around 1,000 delegates. The Leadership Academy have used it in their work. NHS Employers have used it in their Equality and Diversity work. It is shared widely. It is a gift that keeps on giving. What do you hear now in its pulse? If you think this is sad and solemn, it’s not meant to be. Kirstie Stott ended the celebration with the poem happiness. Perfect. 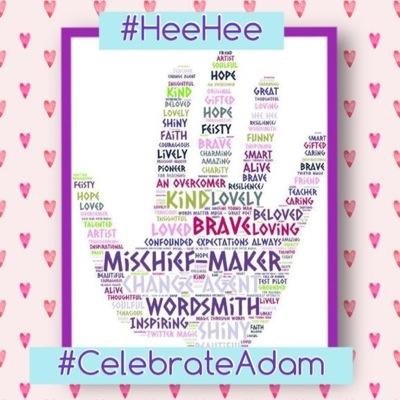 As was her wordle of the three words Adams’ twitter friends had provided her with. Her choice was for her boys to “be like him”.